Pete Evick lives for the music. Ever since he was a young lad music was the one constant in his life. The guitarist, singer, songwriter and producer is now adding entrepreneur and author to his resume’. 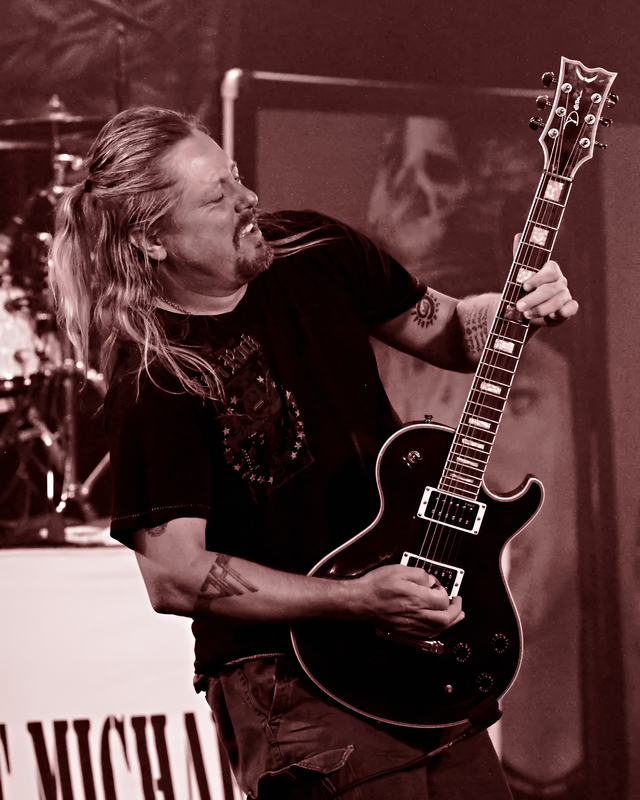 The longest tenured member of Bret Michaels solo band has kept very busy. We had the opportunity to talk to Pete so he could update us on his current ventures. 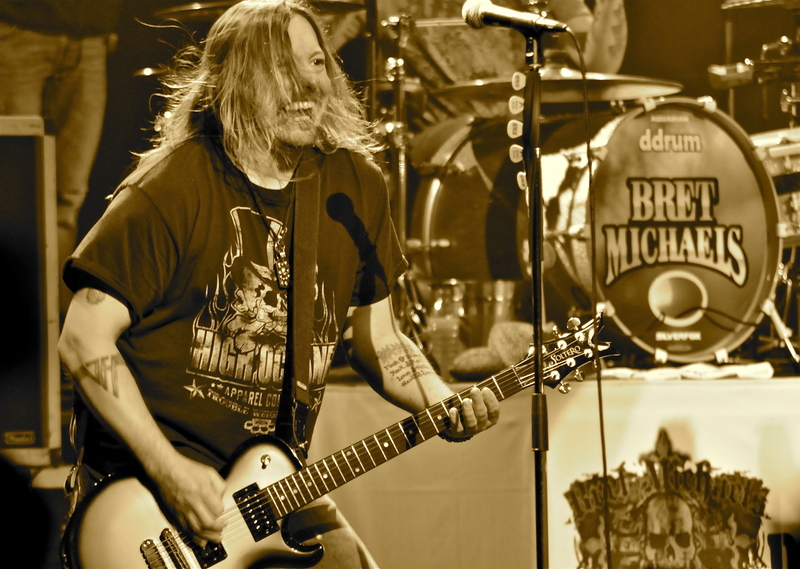 RSC: The Bret Michaels Band has recently gone through some changes. Can you tell us a little about the “new” guys? Pete Evick: We’ve been on the road for a solid ten years without really taking a break and being out for nine months of the year most of the time. Chuck and Ray as you know were local buddies of mine and played with me in my band Evick. Ray was having a baby, Chuck was going through a few things of his own and decided to come off the road for a while. Two new guys bassist Bart Harris and drummer Mike Bailey have played music with me as long as Chuck and Ray. All of us have played together up and down the East coast and the Virginia area over the past twenty years. Bret was kind enough to let me bring in two more of my friends just like last time. It was like we didn’t miss a beat and it was a very easy transition. We are all still family and we all love each other. Just some new guys out on the road with us and all part of the same family. RSC: Give us the rundown on your recent single “Girls On Bars”. PE: The new single “Girls On Bars” is a summer feel good, country crossover type of song. It has a rock/pop sensibility to it as everything Bret does as well as a country feel. As far back as “Every Rose Has It’s Thorn” there was country influence in that. Bret wrote the song with Luke Laird who is one of the biggest writers in country music today. He won the coveted BMI Country Songwriter of the Year in 2012, having co-written five songs that appeared on the year’s most played list. Bret had a rough go last season as we had to stop a few shows and we played out through the winter. When the two Pennsylvania boys sat down Bret said he had a long cold winter and that he wanted to write a feel good summer type of song and that’s where “Girls With Bars” came from. Before we knew it, it became the number one most viewed debut video on CMT and it just took off right away. RSC: You have a book coming out on June 16. Tell us all about “The Moments That Make Us”. PE: Obviously Joe, you’ve been my buddy and I don’t know if you realize it’s been ten years now. About six years ago my marriage split up and when that happened I went through a lot of life changing, soul searching and I started to write a lot of my thoughts. I didn’t know what I was writing about. Some of it was anger, and some was reflection on how this could happen. As I started to write I started to realize there was some information in it that would be inspirational or helpful to broken families. The book was originally called “Kids Are Resilient But What About The Adults We Become.” It was basically written about my fear for how my children would grow up in the world we created. So I started to chase my memories as a child to see how this affected me as an adult. As the book was picked up by a publishing company we started to negotiate different things. They brought it to my attention that the book was much more than about broken families. It was about how life and everybody affects you whether it be a scout leader or a teacher. It was a much bigger vision than what I was trying to make it. So we changed the title to The Moments That Make Us. It begins from the time I was five years old and ends when I am thirteen years old. It has defining moments, I mean fraction of a second moments that sent me on certain paths that enabled me to become who I am today. It’s been an inspiring, soul searching look at yourself to see where you ended up today. I found there was several things in my life that I’ve been holding on to as early on as five years old. Things that were still festering inside me. Some of the things were good things that gave me the strength to pursue a music career. RSC: Tell us about your upcoming single “Awakened” due out on 23. PE: The book comes out on June 16 and the “Awakened” single comes out on June 23. Eventually there will be a full length instrumental album but because of the success of “Girls On Bars” it put all that on hold for a while. I’m so excited about the first single called “Awakened” which will also be the title of the entire album. I started as a guitar player as a kid wishing I was Eddie Van Halen, Randy Rhoads or Steve Vai. As years go by you become a songwriter and some of that goes away. In the last year or two I’ve been inspired to play things like Steve Vai’s Passion And Warfare, Joe Satriani and stuff like that. I sat down to write some music like that. I came up with some stuff that is very interesting that hopefully people will like. I am an enormous Star Wars fan and there is a new movie called The Force Awakens and it was ironic that I wasn’t even thinking about that when I wrote “Awakened”. Because the inner child in me has been awakened and I am excited again about playing guitar. RSC: Is there a different process to write instrumentals as opposed to writing songs with lyrics. PE: In some ways it’s a lot harder because if your writing lyrics you can have the same exact melody because you are saying different things. When writing instrumentals you have to make that melody incredibly interesting or else have many different parts. So to me it becomes a lot more complicated. If I’m writing something with lyrics nine times out of ten I’m inspired by the lyrics first. Then I know what story I want to tell and put that story to music. The instrumental starts off easy and more fun for me because I put a guitar in my hands and come up with what I feel is a cool riff and then from there I try to build it. Usually it starts off simple then I’m racking my brain by the end of it to make it interesting. You ever done something and say oh what have I gotten myself into. That is every time I start to write one of these instrumentals. RSC: You also have a thriving candle company. Tell us how Shining Sol was born? PE: That’s an interesting story. Interestingly enough in my home a few years ago I had this stone worker build me an all stone fireplace which I designed. It was also an entertainment center. It looked like a fireplace, felt like a fireplace, I designed it to only burn candles in it. I spend a lot of time out on Bret’s ranch in Arizona and the air is so dry out there that a lot of people don’t burn real fires they use candles. I didn’t want to deal with a real fireplace and all the things that came with that. I went to the candle store and I bought one that was supposed to smell like a fireplace. When I lit it it did not scent the room enough. It was one of those rare moments when we had a few weeks off tour. Then I went back and bought two more. I would chill out at night and then my brain started ticking. I’ve never had a hobby, never had a day job or another career path. Since five years old I wanted to be a musician and that’s all there’s ever been. I wondered if I can learn how to make that candle better. I made it better than the one I bought. By the time I figured out how to do that, I learned so much about the candle industry. I thought let me start a business. My oldest son is very interested in business. He watched Bret on the Apprentice and he loved how all that went. I felt we can start this simple business and there would be some important lessons I could teach my son. I was born and raised on how to do business the Gene Simmons way. Not one of the top candle companies had a logo or slogan. So I came up with the slogan “Share The Light” which to me is very inspirational. My graphic artist came out with the sun logo on the jars. I’ve got people that have tattooed the logo on their arms. I took the Gene Simmons and Bret Michaels marketing approach and put it in a world where nothing like that existed. I’m a very eco-friendly guy. The wax that I buy is made from soybean that is made in America. Not only did I start a company that is eco-friendly and stimulates the American economy the best I can. It really feels good for my soul. It all started because it was the first thing I’ve ever done in my life that was quiet. RSC: It seems like its taking off good for you? PE: It’s working out. In the three years we’ve been running I’ve exceeded my estimates and expectations and I can’t ask for more than that. RSC: Let’s change gears back to the music business. You’ve been out on the road now for a good ten years. Does it get old? Do you enjoy it as much as you did back when you first started playing with Bret? PE: Well let’s preface that, I’ve been in Bret’s band for ten years. Before that I was on the road ten years before that traveling around in vans up and down the country. We would trip from Washington, DC to California and back over and over again. So I’ve been on the road twenty plus years. Does it get old? Never. Every day you get up there and you play music whether its for ten people or a hundred thousand people, the excitement that your delivering a good time to everyone is a gift. If you’ve been given the gift to entertain somebody, you have to use it, it’s your responsibility. If I can make someone feel better by strumming a few chords and singing a song, how can that get old. I am grateful every day that I get to be that guy. RSC: It’s no secret that you are a big Sammy Hagar fan. What did you think about his latest release The Circle? PE: We just played with Sammy in Puerto Rico. It was probably one of the best gigs of my life. He is so cool and both bands were hanging out having a great time backstage. Then they get on stage and played all my favorite Van Halen tracks and all my favorite Sammy Hagar tracks. Then I get the live album and they captured that energy of what they are doing live. Sammy never fails. He’s one of my favorites of all-time. Every album he does is better than the last in a lot of ways. That live record is mind blowing, the way they do those Van Halen songs and the way Vic Johnson plays without the confinement of being told what to do. You know the answer to that I love it. RSC: What other projects are in the works in the near future? What else do you hope to accomplish in the music business going forward? PE: I got to be honest with you. I’ve done everything I dreamed of and more. If it was all over today I don’t know what else I would say. When I was a kid the local arena held 30,000 people so that was my goal. I played in front of over 100,000 several times, that exceeded my expectation. We’ve had three top 40 records. I’ve been co-writer and in four number one videos. When you are a kid you just want to know what it tastes like. I’ve gotten to come to the table for ten years now over and over again. I say this, I got into rock n’ roll not for the money, not for the women, I was five years old, I didn’t know what any of that was. I was bitten by the honest bug of the music. Over the years you dream about the music industry and there’s all these things you wonder. What’s this like? What’s that like? What’s a tour bus like? What’s backstage like? You just wonder those things, they are more important than money. At the end of the day I have the answers to every one of those questions. I can’t ask for anything more. That being said I love to produce. Me and Bret continue to write all kinds of music whether it be country, rock or pop. The touring, every year the show gets bigger. Obviously there will be a second book and more Evick music and solo music. I am going to keep doing what I’m doing trying to make it bigger and bigger.